Founded in 1979, Travelbag is a chain of high street travel agents located in towns and cities around the United Kingdom. 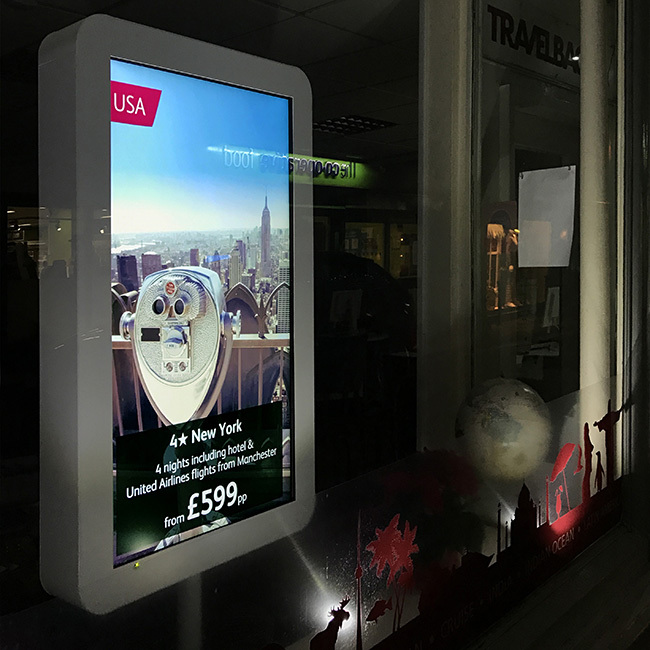 Digital Messaging Company (DMC), a provider of digital signage solution was contracted by Travelbag to provide digital screens and kiosks in their shop windows, with a simple to use content management system. 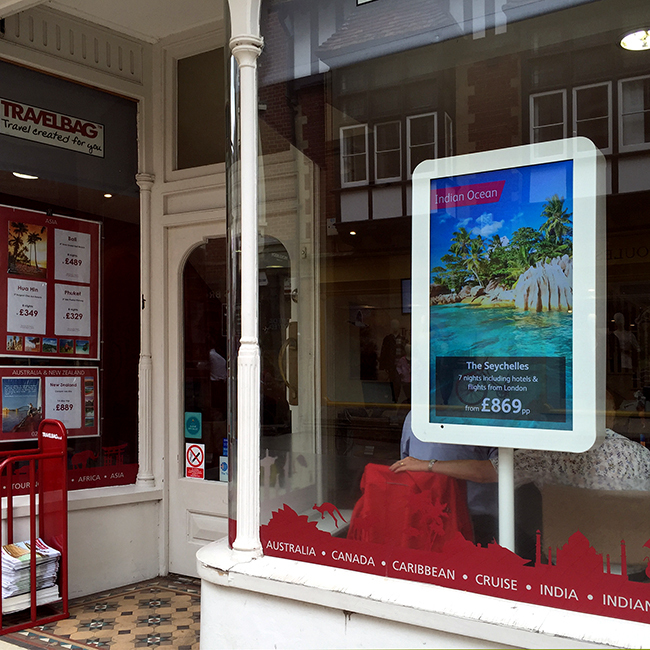 Travelbag wanted to modernise and better utilise their retail shop windows across seven sites around the United Kingdom. 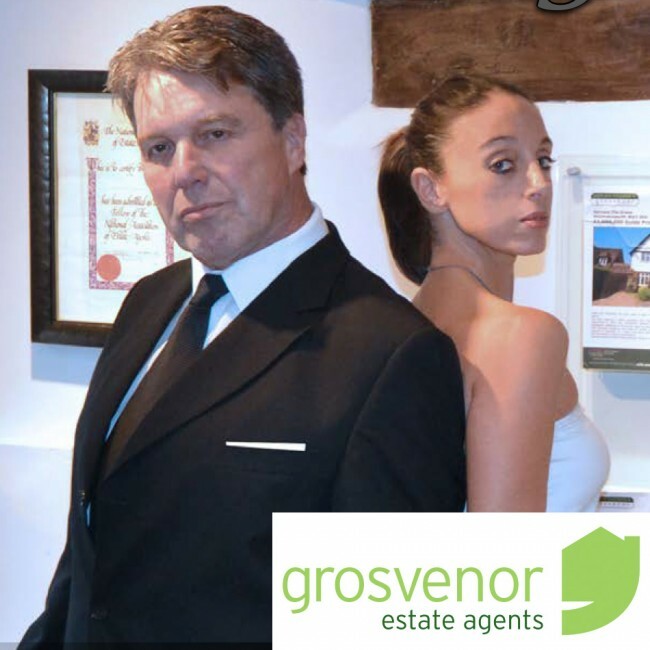 They needed a way to highlight their latest offers in their windows immediately as they became live, in order to stay competitive in the industry and to attract new customers into the premises with the lure of top deals. They were looking for a solution that emphasized the inspirational aspect of travel and presented offers in an enticing manner, combing video, imagery and graphical elements. Travelbag wanted the freedom to promote different offers in each shop at specific times of day, including a layout tailored to that location. We are absolutely delighted with our new digital signage solution from Digital Messaging Company. The team was extremely efficient during the installation and even developed bespoke screen casings designed to match our brand specifications. We found the Signagelive software to be straightforward and simple to use thanks to the thorough training, however DMC’s technical support has always been very quick to respond when needed. Digital Messaging Company engineered a complete digital refresh of Travelbag’s retail shop windows across seven stores. 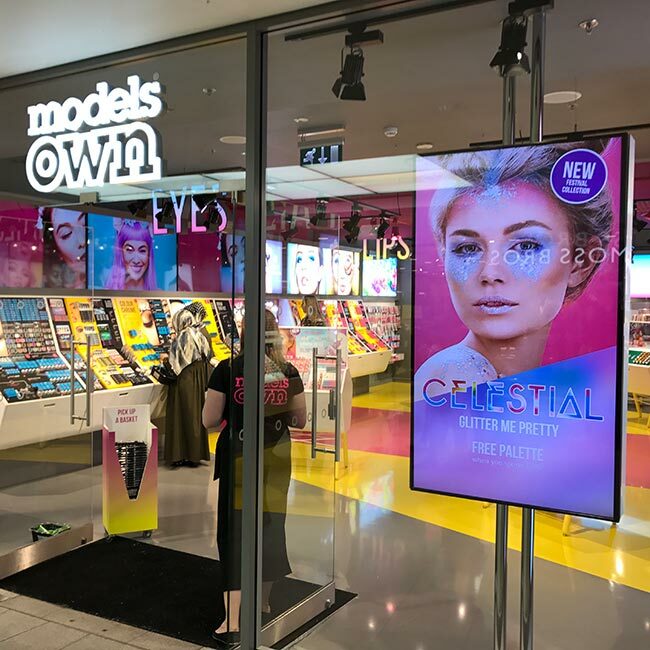 Each location was fitted with between two and five NEC 40” or 46” 700 candela semi outdoor displays with to ensure that the screens would be visible in sunlight. Windows media players running Signagelive cloud based software control the screen content from one central location, ensuring that the right offers are display at the right store at the right time. Each screen is enclosed in a steel shroud custom made to Travelbag’s design specifications by Unicol, providing a sleek solution to the problem of mounting screens within a window space. 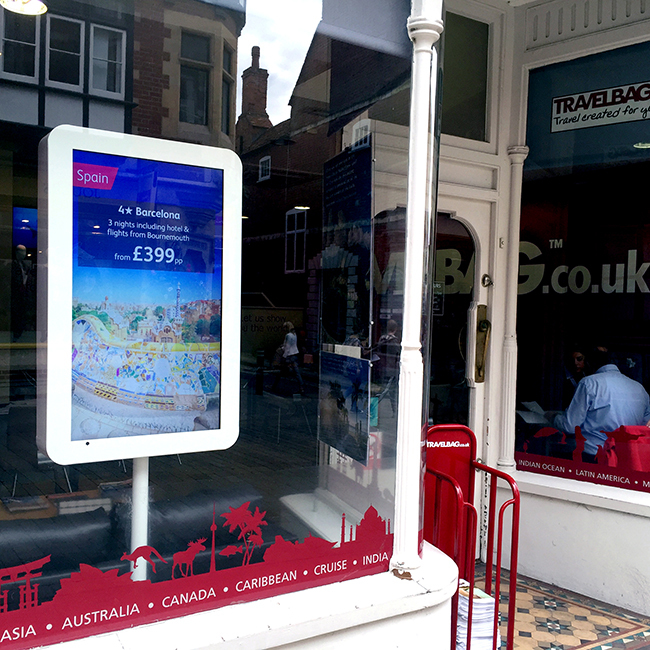 The new screens are now fully operational in every Travelbag shop window. 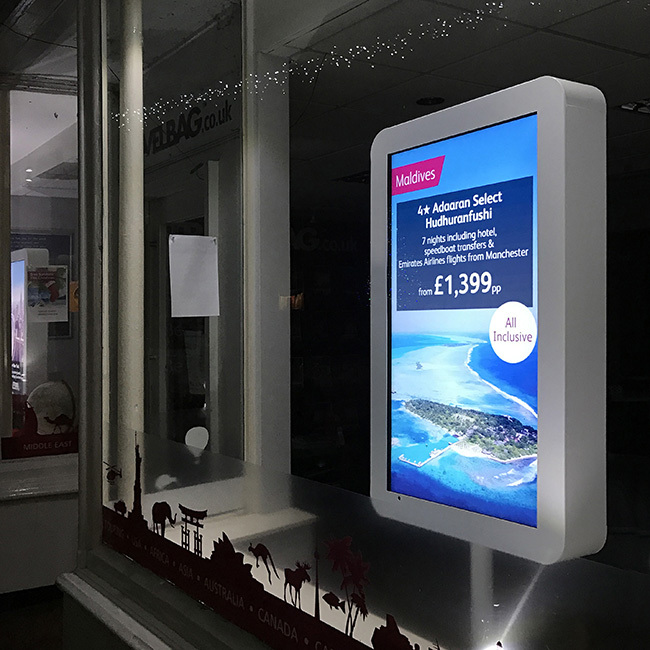 Being able to deploy content on screens immediately via a simple to use interface from one central location has cut down on the amount of time shop staff have previously spent updating window displays with new offers. Travelbag now play travel videos and more inspirational content on screen as a key part of the window display, which attracts more attention from passers-by than the previous static posters. The displays also make their windows stand out in the dark – an added bonus in the winter months.